14 nights aboard the M/S Expedition in twin-share cabins (all with en suite bathrooms and porthole window). Please note that all cabins consist of twin-size berths and are ocean-facing. Sail from Spitsbergen to Greenland and south to Iceland, an unforgettable voyage through the Arctic. in the Arctic from Spitsbergen to Greenland and finally Iceland. Travelling on a warm and comfortable ship, with excellent and plentiful food, you pass through the dramatic scenery with regular trips off the ship both by zodiac and on foot. There are plenty of lectures to fill your day when you are not on deck looking for whales, dolphins and the numerous sea birds. A truly amazing experience. Sailing from Spitsbergen to Greenland to Iceland, this is a voyage of impressive highlights that reveals the contrast and change in the Arctic landscape. We start our journey amidst the dramatic scenery of Northwest Spitsbergen National Park then travel south, following the ice’s edge along the coast of Greenland in search of the amazing wildlife of the Arctic region. Orca, humpback and minke whales are routinely spotted in the Arctic waters whilst polar bears roam the shoreline and unique reindeers graze on the summer vegetation alongside colonies of seabirds. We sail through some of the most spectacular fjord country in the world while exploring rarely visited glaciers, bays and inlets on our regular Zodiac excursions and shore landings. And, we spend time at the tiny Inuit settlement of Ittoqqortoormiit to gain an insight into how these most northerly of people live. On board, we relax and enjoy the good food and excellent facilities on the M/S Expedition and learn about the history, geology and wildlife of the Arctic from the expert expedition team. Our adventure ends in ‘the land of fire and ice’ when we reach Reykjavik. Our ‘Land Only’ and ‘Flight Inclusive from’ prices are based on category 2 cabins, twin-share with porthole windows, and include hotel 4* accommodation in Longyearbyen before the start of the cruise, plus arrival and departure transfers. On board are expert, English-speaking guides who have an intimate knowledge of the area and an infectious passion for nature. They are very hard-working, attentive and helpful. On your Expedition cruise, shore excursions, and on board, lectures will be provided by knowledgeable, expert members of the crew. The M/S Expedition has one of the highest ratios of expedition team members to guests – with one expert for every 10 guests there is always someone on hand to answer your questions and provide greater insight and appreciation of the world at its extremes. The expedition team is comprised of professional and highly skilled historians, marine biologists, and naturalists who offer keen insight and a unique personal perspective to each and every adventure. Their goal is to provide an informed and balanced interpretation of the destination, accomplished through stimulating lectures, day-to-day briefings, and informal discussions. Your lecturers and Expedition Leader will cover all aspects of the voyage including ornithology, marine biology, geography, geology, history and the environment, as well as practical things like photography. The expedition staff work conscientiously with you on deck and in the field, improving your observational skills to allow you to experience all that the destination has to offer. Their strong sense of ethics and ecological knowledge make for stimulating and mindful conversation whether onshore or at the dinner table. The Expedition Staff will pilot the Zodiac landing craft used for shore landings and Zodiac cruises; they are experienced drivers who operate the Zodiacs in a responsible manner. Fly from London to Longyearbyen via Oslo. Day 2 - Arrive Longyearbyen in the early hours. Morning at leisure. Embarkation on M/S Expedition in the afternoon. You will arrive in Longyearbyen soon after midnight. On arrival you will find a Flybuss shuttle service waiting outside the airport which will transfer you to your hotel. You need your transfer voucher to hand for this service which goes to all Longyearbyen hotels. On arrival at your hotel you will check in and get some rest. After breakfast you are free to relax around your hotel and explore Longyearbyen at leisure. While not the main event Longyearbyen is an interesting place to spend a day. The town is the largest settlement on the archipelago of Svalbard with a population of about 2,060 people and about as many snowmobiles. The Governor of Svalbard resides here. Most of the inhabitants are Norwegian, and some are Russian. Located in the Advent Fjord at the entrance of the Advent Valley, this community has an infrastructure fit for a much larger city. Within the islands, there are four inhabited settlements and some scientific stations. Barentsburg, a Russian coal mining settlement, has approximately 850 inhabitants. Sveagruva, the functional Norwegian mine, has around 100 inhabitants, and Ny Ålesund, a scientific settlement, has between 30 and 150 inhabitants, depending on the season. All settlements are found on the west coast, the part of Spitsbergen with the mildest climate due to the warm Gulf Current. Longyearbyen is located at 78°13°N 15°33°E. Due to its location far north of the polar circle, it is polar night from mid-October to mid-February and polar day from mid-April to mid-August. Longyearbyen has an arctic tundra climate. All passengers are required to drop their luggage at the meeting point between 09:00-13:00. Conveniently the meeting point is the Radisson Blu Polar Hotel. All passengers will be transferred to the ship as a group for embarkation at 16:00. You can also walk down to the ship as it is only 10 minutes from the hotel. When you embark you are given a card which is your identification and used to swipe off and on the ship each day to ensure you are not left on shore at any point! It is also used for any purchases and the final bill paid at the end of the cruise. Day 3 - Cruise Spitsbergen / Greenland Sea. By not having a set itinerary, we take on an expedition spirit and are free to seek out the best that Svalbard has to offer. Each day will be planned to take advantage of local ice and weather conditions. Distances are relatively short in the Archipelago and seas relatively calm. Svalbard is one of the few places on the planet that offers such a wealth and diversity of natural and cultural history sites. You will visit ice-covered seas, fjords with breathtaking mountain scenery and glaciers flowing into the surrounding sea. Day 4 - Cruise Spitsbergen / Greenland Sea. Over the next four days you will explore a small portion of the western coast of Spitsbergen. Entering the autumn, the days are getting shorter so try to take advantage of all of the sunlight possible to search for wildlife. You will spend these days in search of the elusive polar bears as they hunt seals. You will also keep a close lookout for Arctic foxes and Svalbard's unique subspecies of reindeer - although much smaller than their southern relatives, they still carry impressive antlers. The Zodiacs will be primed and ready for one or two shore landings per day or to cruise around the ice floes. Ice permitting, spectacular bird cliffs filled with thousands of murres (guillemots), as well as kittiwakes and glaucous gulls. A little auk colony will also be on your agenda. The plant life here has adapted to survive in this terrain and you will have the opportunity to observe and discuss some of their adaptations to what is considered a harsh environment. This is also a land of history: from whaling to reaching for the pole, to trapping, coal mining and war, and you will visit some of these historic sites. Day 5 - Cruise Spitsbergen / Greenland Sea. You continue sailing through the Greenland Sea and exploring the coast of Spitsbergen. Along with time for wildlife observation the ship, the M/S Expedition has a range of other resources you can enjoy during your cruise. Below deck, the ship's library has an array of literature to expand your knowledge, whilst a sauna and gym are available for those looking to keep fit and active. The Poar Bear pub is a great place to relax and share the events of each day with your fellow travellers, and you may also enjoy live music in the evenings as well as many presentations throughout the voyage. Meals are served in the spacious dining room and food is both plentiful and prepared to a very high standard. Day 6 - Cruise Spitsbergen / Greenland Sea. As you continue our cruise, there will be time to discover enjoy the many facilities on board the M/S Expedition Polar cruise ship. The two large observation decks give superb views of the surrounding land and sea and the aft deck even provides an opportunity for an al fresco BBQ if the weather holds good. You can even venture onto the bridge and meet the Captain and crew at any time. Keep an eye out for whales, which are known to feed here in the summer months. You may spot Spot orca, humpback and minke whales, as well as dolphins. Frigid waters drain from the Arctic Ocean in a southwest current along the coast of northeast Greenland. Often drifting pack ice is pushed along the coast. We will attempt to approach and follow the pack ice edge to explore the polar seascape. Along with sea mammals you should also expect sightings of many sea birds such as kittiwakes and fulmars. Day 8 - Cruise Greenland Sea / Scoresby Sund. 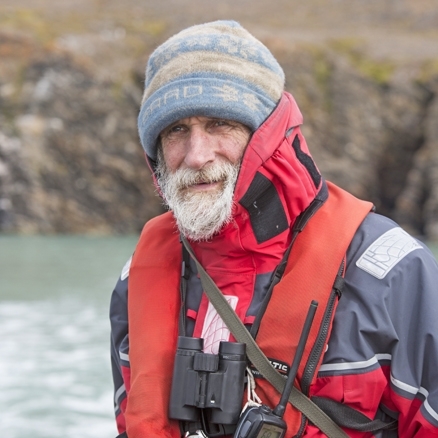 Along with wildlife viewing from the observation decks and Zodiac tours, you can enjoy daily lectures presented by experts from the M/S Expedition team on a range of subjects including wildlife, geology, photography and the history and exploration of the Arctic. Day 9 - Cruise Scoresby Sund / Denmark Strait. The ship will sail through and land in some of the most spectacular fjord country in the world, down the coast of Greenland, while exploring rarely visited glaciers, bays and inlets. This is the Northeast Greenland National Park - the largest and most northerly national park in the world. It is nearly impossible to reach except on expedition ships. Spectacular geology combined with glacial features create steep mountains raising directly from the sea. Look out for picturesque scenery, wildlife and other interesting landing sites in this unspoiled wilderness. Depending on ice, spend these days exploring the massive fjord system of the region, which includes portions of Scoresby Sund. These intricate fjord systems are everything from wide and unimaginable to narrow and steeply spectacular with some of the best mountain scenery in the world. Walking over lush stands of colourful autumn tundra may lead to opportunities to see muskox grazing nearby. You may visit the tiny settlement of Ittoqqortoormiit for a look at how these most northerly people live. This isolated town in Greenland is far from any other inhabited settlements and is only accessible by expedition ships three months of the year. The town's population of 450 rely on hunting and fishing as they only have one grocery store. Locals enjoy the warmer spring weather and sunshine by taking dog sled or snowmobile trips as well as camping. The ship will continue sailing along the east coast of greenland, making frequent stops and exploring the sea and land by Zodiac and on foot. Each day will undboutedly bring new and exciting wildlife sightings and endless opportunities for photographing the beautiful ice-clad landscape. Day 11 - Cruise Scoresby Sund / Denmark Strait. Sail south along the east coast of Greenland, exploring as you go. Day 12 - Cruise Scoresby Sund / Denmark Strait. Continue to sail south along the east coast of Greenland. Day 13 - Cruise Scoresby Sund / Denmark Strait. Continue your voyage sailing south along the east coast of Greenland. Day 14 - Cruise the Denmark Strait to Reykjavik. Cruising now through the Denmark Strait, the ship is nearing Iceland and the steaming hot springs of Reykjavík. Although, sadly coming towards the end of your Arctic adventure there is still time for more wildlife spotting. Views from the large observation decks are often complemented by passing whales and soaring birds including fulmars, kittiwakes, gannets, guillemots and razorbills. Day 15 - Cruise to Reykjavik. This is your last day onboard the M/S Expedition and your last chance to enjoy the great facilities onboard and to take some final photos of the wildlife and scenery. Day 16 - Disembark M/S Expedition. Fly Reykjavik to London. Shortly after breakfast you will disembark in Reykjavík, within walking distance from downtown. Transfers to the airport are available to all passengers who have flights booked on the disembarkation day. Immediately upon disembarkation there will be a transfer to the airport, that includes a stop en route at the Radisson Blu 1919 Hotel. Passengers planning on staying in Reykjavik post trip, may take this transfer, or hire a taxi at the pier for transfer to their accommodations. For those with flights later in the day, we will offer a luggage storage area at the pier, until 2pm, (timings to be confirmed on-board), at which time a transfer will be provided to the airport for those passengers with early evening and evening flights. Passengers taking advantage of this opportunity, will be able to explore downtown Reykjavik in the morning, and early afternoon. All transfer arrangements will be confirmed while onboard prior to departure, to ensure that all needs are met. If you wish to extend your time in Reykjavik we can book hotel nights and suggest activities to enjoy in this cosmopolitan and lively city. A wonderful adventure and experience which far exceeded our already high expectations. The expedition leader, ships captain and all the support staff were excellent, very professional, knowledgable and caring. An excellent itinerary which had the right balance of activities including zodiac cruises, walks or hikes over the tundra, wildlife watching and informative lectures. Highlights were seeing seven polar bears, numerous walruses, Wales and seals, arctic fox and hare, lots of sea birds and the Aurora Borealis. A cruise which heads south enabling you to witness the contrast and change in the Arctic from Spitsbergen to Greenland and finally Iceland. Travelling on a warm and comfortable ship, with excellent and plentiful food, you pass through the dramatic scenery with regular trips off the ship both by zodiac and on foot. There are plenty of lectures to fill your day when you are not on deck looking for whales, dolphins and the numerous sea birds.